Check it out. I'm in a bucket! We have a small balcony. It measures just 4' x 12', but we love it. We tried to maximize the space by by using storage benches that we can use as tables and chairs and put stuff in, instead of just having a little table and chairs. 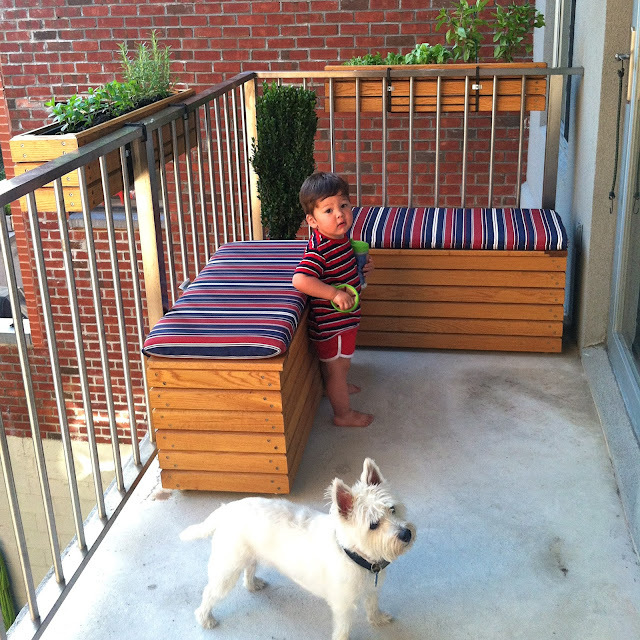 Also, we put our window boxes on the outside of the railings, so the herbs don't eat into the balcony space. We even have room for a tiny grill out there and it still doesn't feel crowded. One thing we didn't think we had room for was a kiddie pool. 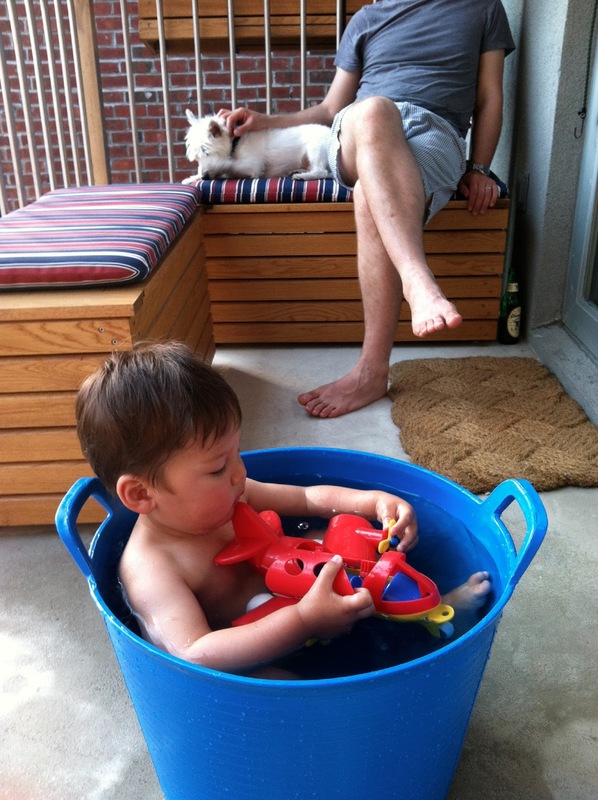 But, that didn't stop us from coming up with our own NYC-sized kiddie pool. 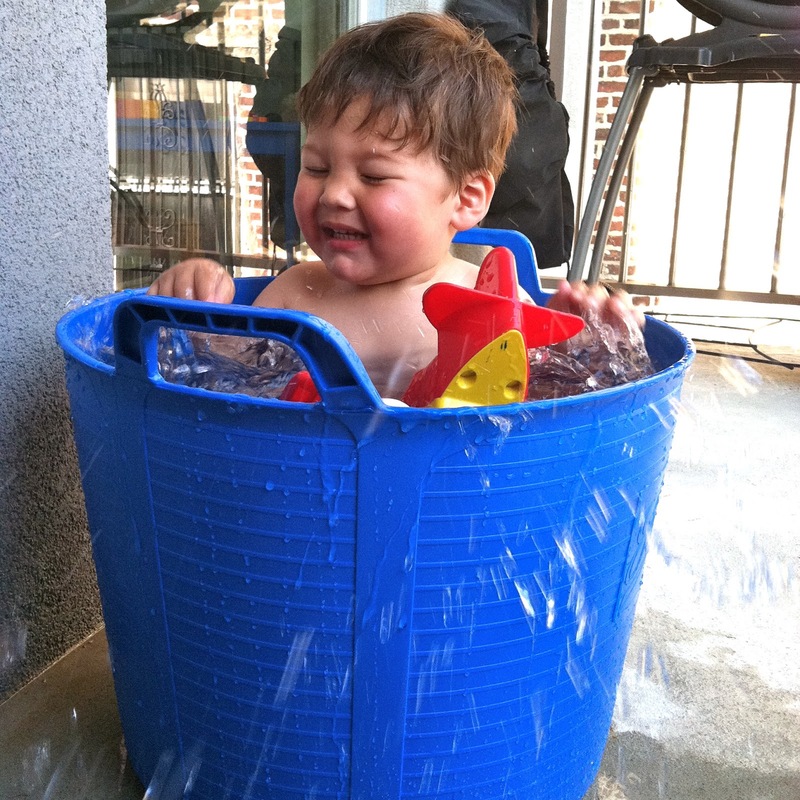 Read on to learn more about giant buckets (aka tiny kiddie pools) and where you can buy them. We got the above large blue plastic bucket (by a Spanish company called Fiel) at the store Future Perfect. I see now that the store only has black ones left and on sale. But, I googled around and found this company called Tubtrugs that makes similar buckets in a lot of different sizes and colors. I think our bucket by Fiel is the size of the Tubtrugs Extra Large bucket. Their large, shallow size could also work well for a baby or child. 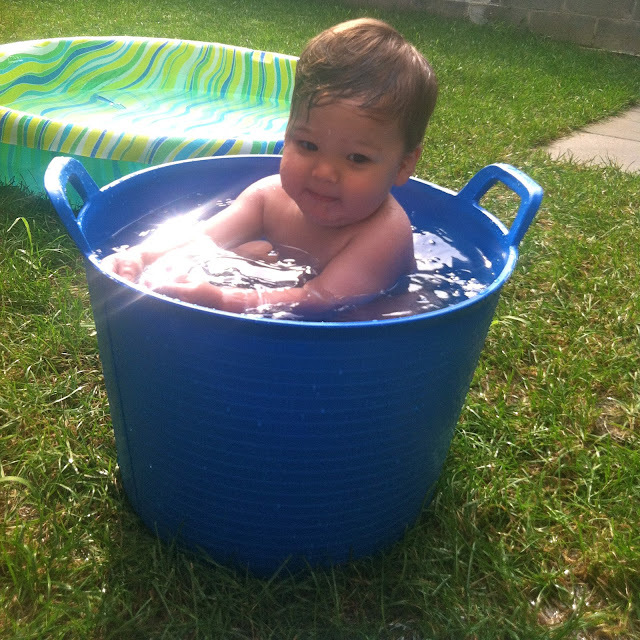 The great thing is, the bucket isn't just a great kiddie pool. On a day-to-day basis, we use this bucket for Greyson's toys, but it's come in handy for lots of things. I've soaked laundry in it and we've used it to carry stuff in (since the bucket is flexible and the handles come together). You could even give the dog a bath in it. A giant bucket like this is one of those simple yet multi-functional houseware products you end up loving because you come up with so many uses for it.